Chinese stocks dropped to their lowest level in a month on the last trading day of this week amid speculation the central bank won’t add to stimulus. The Shanghai Composite Index fell 0.7 percent at the close. The gauge has lost 2.5 percent this week, the most since May, after plunging on Monday amid a jump in the cost of borrowing the yuan in Hong Kong. Commodity producers paced a retreat in Shanghai after U.S. oil prices slumped. The Hang Seng China Enterprises Index extended declines after its steepest two-day drop in seven months. Monday’s tumble broke a calm that had persisted for weeks in mainland equities as a selloff in global markets added to concern about higher funding costs. Better-than-expected economic data on Tuesday fueled speculation the central bank will hold off lowering borrowing costs. The Shanghai Composite gauge closed at 3,002.85, after briefly dropping below the 3,000 level where state-backed funds were speculated to have intervened in the past. China Petroleum & Chemical Corp. dropped 1.2 percent, the most since June 24, after U.S. oil prices slumped 3 percent on Tuesday amid concern a global supply glut will persist. A measure of consumer-discretionary shares declined 1 percent as Midea Group Co. slid to its lowest close since July 11 and FAW Car Co. retreated from a three-week high. Official figures released on Tuesday showed China’s data on industrial production, retail sales and fixed-asset investment all beat estimates. The data may have increased uncertainty over the timing and strength of additional policy support, UBS Group AG economists led by Donna Kwok wrote in a note. The Hang Seng China Enterprises gauge slipped 0.2 percent as of 3:17 p.m. after dropping 4.8 percent in the previous two days, while the Hang Seng Index was little changed. Casinos advanced, with Sands China Ltd. climbing 1.3 percent after Chairman Sheldon Adelson said Macau’s gambling industry has hit bottom. Parkson Retail Group Ltd. surged as much as 68 percent after saying it’ll sell a Chinese subsidiary whose main asset was a loss-making department store in Beijing. The Hang Seng China AH Premium Index slipped 0.5 percent, nearing its lowest level since 2014. Chinese shares in Hong Kong have outperformed their mainland counterparts this year, with the Hang Seng China Enterprises gauge slipping 1 percent, compared with a 15 percent loss for the Shanghai Composite. 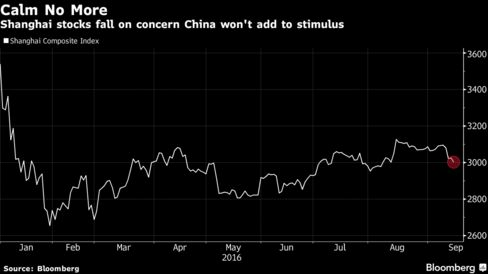 Still, options traders are betting on a rebound for mainland Chinese shares. The cost of bullish contracts on the China 50 exchange-traded fund is near the highest level this year relative to bets that profit from a decline, data compiled by Bloomberg show. There are expectations for the A shares to catch up with their Hong Kong peers, said Caroline Maurer, head of greater China equities at BNP Paribas Investment Partners in Hong Kong.